Portland Chapter monthly meetings have 70 to 100 attendees. Meetings are normally held the first Tuesday of each month at the First Congregational Church at 1126 SW Park Ave, Portland, OR 97205. 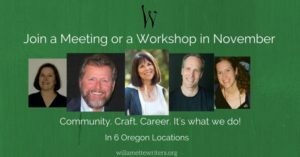 No meetings in August when we head to the Willamette Writers Conference. Developing the setting of your story can make the character voices sharper, the action more vivid, and the plot complications more realistic. But how do you create a deeper and more vibrant world Join us on May 7th at First Congregational Church in downtown Portland at 7PM (doors open at 6:30PM) for a workshop with author Rosanne Parry. This workshop will cover ten techniques for researching and writing a compelling setting for your story. 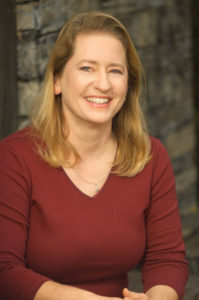 Rosanne Parry is the author of six middle grade novels. The most recent are Last of the Name and A Wolf Called Wander, published by Learner and Harper Collins. 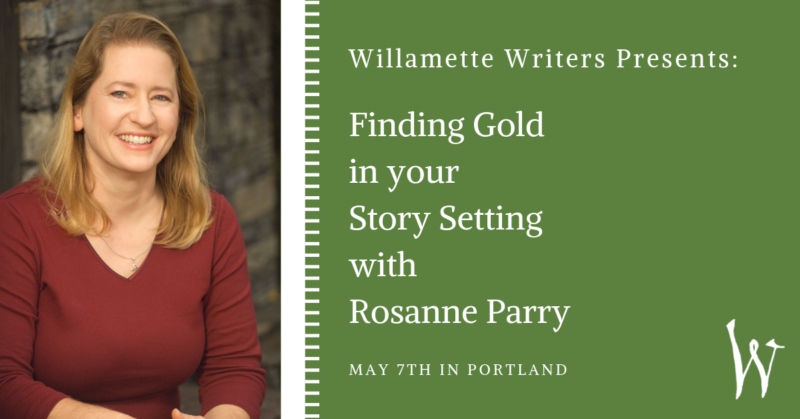 Rosanne is a part-time bookseller at Annie Blooms, and is the captain of the League of Exceptional Writers, a free mentoring workshop for young avid readers and writers, sponsored by the Oregon SCBWI and Powells Bookstore. She writes in a treehouse in her backyard. 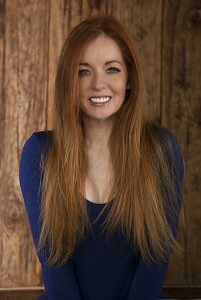 Find out more about Rosanne here. 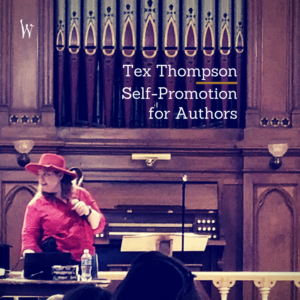 The Portland Chapter of Willamette Writers meets the first Tuesday of the month at the First Congregational Church in downtown Portland. Members are free, guests are asked for a $5 donation. Writers ages 18 and up are invited to attend. 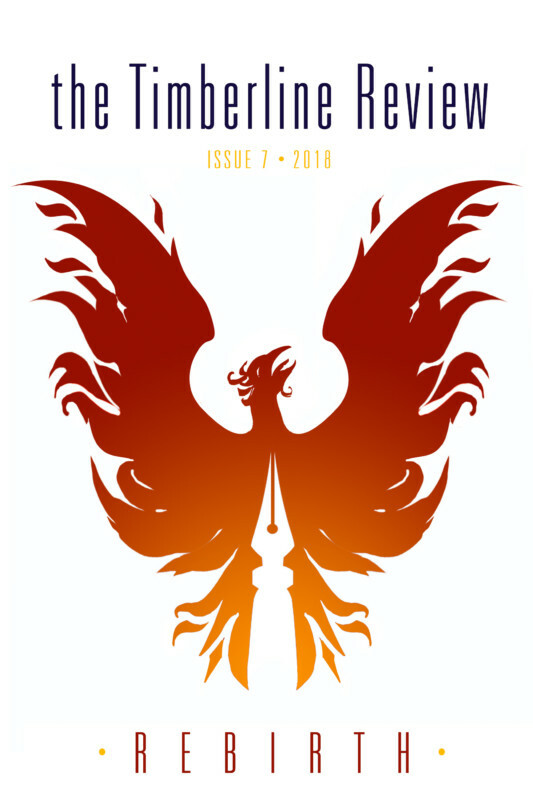 For more information about our Young Willamette Writers, check out: willamettewriters.org/yww. Meetings are held at the First Congregational Church at 1126 SW Park Ave, Portland, OR 97205. The Portland Chapter is run by two co-chairs who together create a program to fit the needs and interests of the Willamette Writers members from the Portland area. Bill is author of A Story is a Promise and The Spirit of Storytelling, a workbook that explores how to create dramatic, engaging stories; and web master of Essays on the Craft of Dramatic Writing, a site that explores principles of storytelling through reviews of popular movies, books and plays. His plays have been produced around the US, Mexico, and England. Visit Bill's website, storyispromise.com and follow him on Facebook @bjscript and on Twitter @bjscript. Join our meetings and workshops if you’re a writing enthusiasts from the Portland area, if you happen to be in the area, or if you are interested in a specific topic/speaker. All writers 18 and older welcome. Join us! Mary Andonian & David Poulshock launch ISA Third Thursdays Members Mary and David are launching the local chapter of the International Screenwriters Association(ISA). It’s a monthly mixer for screenwriters on Third Thursdays, where you can mingle with fellow screenwriters, meet film and television industry professionals, and win door prizes — including a free Willamette Writer’s annual membership. Willamette Writers is excited to be a co-sponsor of ISA Third Thursdays, starting October 18th, along with the NW Film Center. Guest Speaker Tim Williams, Executive Director of Oregon Film, will talk about the new wave of film projects developed right here at home, in Oregon, starting from screenplay to completion. Register now (it’s FREE) before the event fills up, right here. 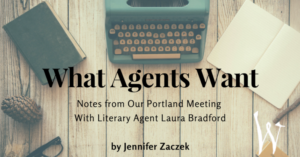 At the April 4 Willamette Writers meeting, attendees got to hear from Laura Bradford, founder of Bradford Literary Agency, about what agents look for in writers. Here are some key takeaways from the presentation. Are You Someone Agents Want to Work With? Be nice. If your personality is too demanding, or if you are not receptive to the agent’s changes or suggestions, you likely will not get representation. Be cognizant of your social media presence. Laura admitted to looking at authors’ social media profiles if she likes what they’ve submitted—this gives her a glimpse into the author’s personality, and she can get a good feel for whether this will be someone she wants to represent. What Are Agents Looking For? 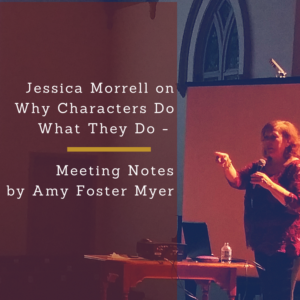 Laura sympathized with writers who are tired of hearing agents say they want something “new and fresh.” Ultimately, she said, agents want “something that’s the same enough, but different enough.” How Important Is Personality in a Query Letter? Literary agents get hundreds of queries a month—Laura said she gets about a thousand. When an audience member asked how important it is to show personality in a query letter, Laura said that with the amount of queries she gets, you wouldn’t be the first person to try something new and different in your query. She likely won’t read it and think, Wow, I’ve never seen that before. Agents read through query letters quickly, so don’t waste their time. Laura’s advice: Get to the point, and provide the details agents are looking for: title, word count, genre, and hook. And be sure to follow submission guidelines. Good Luck! Join us for a meeting or write-in in November! Happy November! We have a great month ahead of us at Willamette Writers. We’re kicking off the month talking about memoir in Eugene, and then Patricia Morrison will show us how to finish our projects. We will explore Fearless Writing in Portland with William Kenower, and also dive into improv with Marian Scadden. David Paul Williams will bring us into contracts, and we’ll finish out the month with meetings in Corvallis and Newport. We will be writing throughout the month in celebration of NANOWRIMO (National Novel Writing Month). If you want to get words in too, join us at one of the many write-ins across the state. We’ve listed a few of ours, then linked to so many others. Good luck with NANOWRIMO, and happy writing this November! -Willamette Writers Team Chapter Meetings Mid-Valley Chapter Memoir: It’s Not About You with Linda Clare November 2nd at 6:30 pm at Tsunami Books Southern Oregon Chapter 7 keys to finishing your big project with Patricia Morrison November 4th at 9:30 am at Central Point City Hall Council Chambers Portland Chapter Fearless Writing with William Kenower November 7th at 6:30 pm at the Old Church Portland Young Willamette Writers Dialogue, Improv, and Writing Scripts and Fiction with Marian Scadden November 7th at 6:30 pm at the Old Church Salem Chapter “Contracts, Copyrights & Taxes, Oh My! What Writers Need To Know About Business” with David Paul Williams November 16th at 6:30 pm at the Salem Public Library Corvallis Chapter November 27th at 6:30 pm at Corvallis First Presbyterian Church Oregon Coast Chapter November 19th at 2 pm at the Newport Library Write-ins Willamette Writers at Another Read Through in Portland We’ll meet every Monday from 10 am to noon in the loft! Join us! Official NANOWRIMO events NANOWRIMO Write-Ins in Portland NANOWRIMO Write-Ins in the Rogue Valley NANOWRIMO Write-ins in Salem NANOWRIMO Write-Ins in Corvallis For more information on NANOWRIMO, click here. You wrote a book. It’s been acquired! Now what in the world do you do with yourself? Every writer has heard the axiom that penning a book is only the first in a long run of hurdles, and if we’re honest with ourselves every last one of us has believed that must be a mendacious proposition. Writing is hard work.